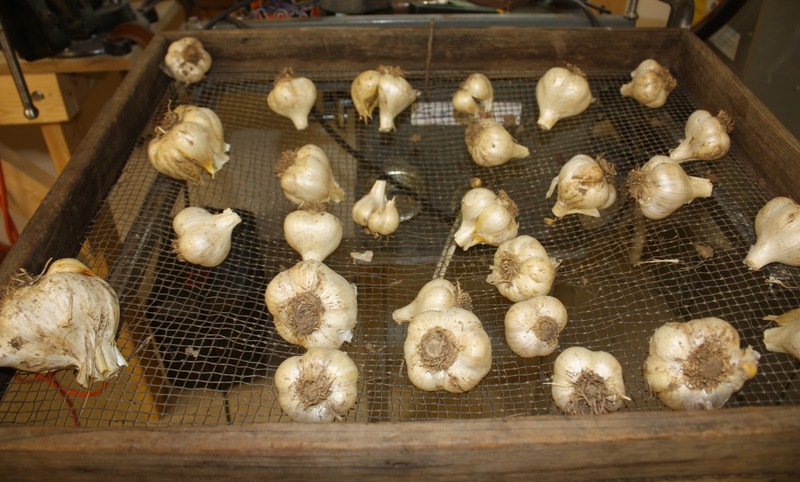 You are here: Home / Uncategorized / Grow Your Own Garlic :: Planting Time is Now! 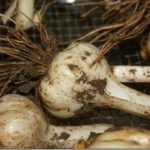 Grow Your Own Garlic :: Planting Time is Now! Growing garlic is super easy and it’s now time to plant. Back in June, I did a post on harvesting garlic and had requests for a “how to” post when garlic planting time arrived. Get out your shovels because planting time is now! The first step in planting garlic is to pick a spot where there is plenty of sun and where the soil won’t be too damp. I picked a spot next to an area where I grow herbs and beside an area where I attempt to grow cut flowers. (I say attempt as the deer ate most everything I planted in this area this year.) I cleared out an overgrown Tarragon from my herb area to make room for the garlic plants. Note that I have a few small garlic plants already growing. These started from small seeds that were attached to the large garlic heads that I harvested in June. Nature gave me a gift! 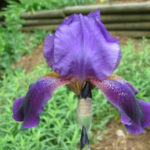 After you’ve selected your area, loosen the soil by hand digging or if you are planting a large area, tilling. I turn the soil over and over with my shovel, chopping at clumps with the shovel blade to break them apart. 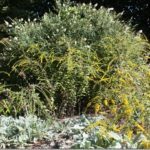 Adding compost to the soil before planting is a good idea. I also sprinkled some 10-10-10 on my soil but if you want to be a 100% organic gardener, skip the fertilizer. After sprinkling on the fertilizer, I dug it into the soil with my shovel. What I’m carrying here are the remains of my 2010 garlic harvest. This garlic will become my 2012 harvest! I store it in my basement hanging in mesh bags. These small baby cloves were in the bottom of the mesh bag. I planted them in a separate area but they will need a few growing seasons before they are big enough to harvest. The five garlic heads that I had left from 2010 were the perfect amount for my 2011 planting. If you want to plant garlic and you’ve never grown it, plant what you buy in the grocery store. That’s what I did long ago when I planted my first crop. Separate the heads into cloves. Garlic is planted about 4” apart. I spaced mine out a bit more than 4”. 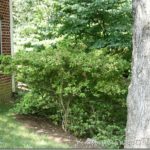 Plant each clove about 2” deep. I went a bit deeper as my cloves are extra large. After planting I mulched the garlic area with leaves that I finely chopped using my lawn mower. I did this by using the bag attachment and then running over some old leaves that I’ve had piled up behind my shed for a few months. 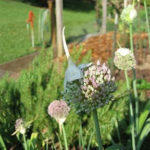 The areas to the left and right of the garlic patch are mulched with decomposing leaves to prevent weeds from growing. This shot is from July after my harvested my garlic had cured. I have a plentiful supply for the rest of 2011 and for 2012 and it’s pretty much a free crop since garlic is self sustaining once you plant it for the first time. That’s it! Garlic growing is easy and almost fool-proof. Get some garlic cloves, get them planted, and you’ll have your own garlic to harvest next June. 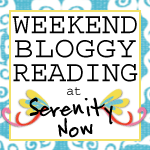 I’m sharing with Amanda’s Weekend Bloggy Reading Party at Serenity Now. Click the button below to join the fun! The weather here is beautiful right now Paula so I’m going to get some garlic planted today. Thanks for the information. How deep did you plant the individual pieces? I never thought about planting my own garlic…might have to give this a try! Wow….I didn’t realize growing garlic was so easy. Have you found that the deer and other animals leave your garlic crop alone, or do they like to eat it as well? Totally off topic, but I have to compliment you on your great arm muscles! Thanks for the reminder. Back from your first post, I told my hubby I wanted to grow garlic and I told him about your post showing how to grow & harvest it. I was planning to use store bought garlic heads but he told me on Saturday that he received an email that my garlic was on it’s way. He apparently ordered some from an online company. Either way, I’m excited and can’t wait. 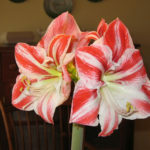 I hope I don’t kill it (I have a brown thumb). This is so cool! I never knew we could grow garlic. We love garlic and this would be so much fun! 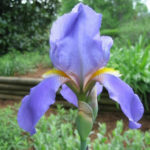 Going to buy some this weekend and plant some! Thank you so much for sharing! Wow! I never thought of growing my own garlic. I think I’ll have to do this this weekend. Thanks for sharing! So I gather that you plant garlic just like other bulbs–plant in the fall to harvest in the spring/summer! But I want to be sure I understand–do you separate a head of garlic into individual cloves to plant, or do you just plant the whole head? Perfect timing for this post – just yesterday I told my husband I want to try to grow my own garlic. Pinning this so I don’t forget.